This video explains why it’s not a good idea to coat a metal roof with silicone spray. This video demonstrates how we went about to save a metal roof. Based on the research conducted by Metal Building Manufacturers Association (MBMA), pre-engineered metal buildings constitute over half of all the latest, low-rise one and two-story, non- residential structures in the U. S. Based on this huge quantity of constructions with metal roofs, there will be a need for repairs in the near future. 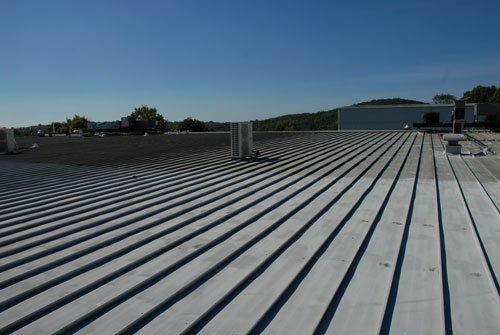 The expansion and contraction, of metal roof structures, is caused by temperature changes. The stress of moving to the screws and neoprene washers, against metal panels, leads to leaks when the torque tolerance weakens. Another cause of leaks can be found at the end and side laps of metal panels, where the initial butyl tape or caulk seals, shrinks and creates gaps. A more obvious cause of leaks comes from the accumulation of standing water which leads to rust and eventually corrosion. To learn more about coating product properties as well as see the additional usage applications, go to EonCoat learn more about the product properties as well as see the additional usage applications. Our website also includes updated industry news and blog posts about protective coatings. There are a couple of methods that we have seen used to recover or repair a metal roof. One popular method is to spray the entire roof with a silicone coating, even though there are only a few areas that leak. Despite the surface preparation, the application of a primer, the fantastic appearance, and the cost-effective claims, this type of coating only lasts 3-5 years. During this time, pinpricks and expansion and contraction cracks develop causing water to collect between the coating and the metal. This water accumulation is not detected until the compromised area of the roof has rusted through. We have developed a method, of metal roof recovery, by using a technique that we perfected, from many years of installing flat roofs. It is relatively inexpensive and involves the combination of rubber membranes and adhesives. Repairing rusty metal with liquid or elastomer products is a challenge because these materials do not stick to metal permanently. We have overcome this challenge by developing a method that attaches a rubber membrane to the metal with little surface preparation. The rubber not only adheres to the metal, but it also expands and contracts, where all other coatings have less elasticity and tend to crack, after only a few years. This method of repair is also cost effective because our repair technique extends the life of the roof significantly. It doesn’t matter how many leaks a roof has or how rusty it is, as long as it can be walked on, we can fix leaks with a rubber membrane, at a fraction of the cost for a replacement. Every metal roof has its own challenges, but we’ve always had success repairing roofs that have had the fewest repair attempts. When those repair attempts include the use of silicone caulking or sealants, as a fix, the removal of such sealants becomes labor intensive. These materials are very difficult to remove from the metal to achieve the best bond for our materials. We use a petroleum-based sealer and adhesive that adheres to metal even when it is rusted. Repairs with our method are less expensive than the costs of silicone or epoxy coatings. The rubber has embedded ceramic granules for protection against harmful UV rays. The rubber expands and contracts with the metal. The image below shows that water cannot flow past objects freely, so the ponded water will cause the metal roof to develop rust. The image below shows rust where standing water remained because it was not able to flow past the seam in the roof. Notice that in the image below, caulking is used to seal flashing, which is not a permanent repair. A common material used to repair leaks, around roof top units, on a metal roof, is tar. This method is very temporary because the tar will dry out and crack very rapidly. In the image below, we removed the old tar and cleaned the flashing around the skylight. It is important that old caulking and sealants be removed before our rubber membrane can be applied. After everything had been cleaned, we installed our rubber membrane with a special bonding agent. This type of repair will outlast any other sealant, caulking or tar. It covered all the seams and any area that had rusted through. The surface is now smooth and water can flow freely. Below is another example of the damage caused by ponded water. The tar around the vent pipe has dried and cracked and began to leak. We repaired it by installing a rubber membrane around it. The flashing around this vent stack was tarred. The tar eventually dried and cracked. After we removed the old tar and cleaned the metal surface, we installed our rubber flashing around the vent stack. This will last for many years to come. 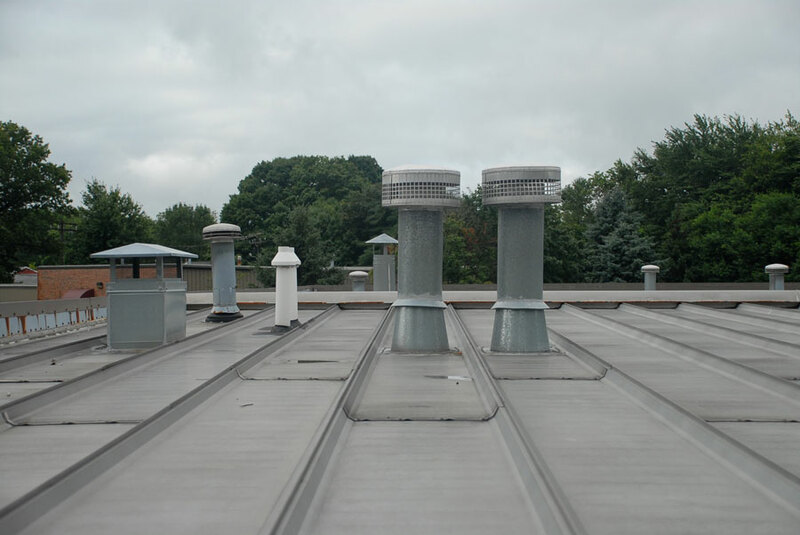 Whenever there are rooftop units like vents, skylights, or fans, the chances are that water will accumulate around the flashing, causing the metal to rust and increase the potential for leaks. Below is another example of a temporary repair using tar to seal open space around flashing. The tar dried and cracked and needed to be permanently repaired. This is another example of a temporary repair using tar to seal open space around flashing. The tar finally dried and cracked and a permanent repair is needed. The edging of a metal roof is prone to leaks. The gutters and gutter hangers are fastened to the edge of the roof with screws. Those screws and brackets sometimes loosen up and cause the roof to leak. We use the same rubber membrane to repair the edging. We install a rubber membrane over roof joints, flashing and any areas where metal has corroded. This is the best solution for any metal roof. I recently watched one of your youtube videos on roof repair as was wondering if I could get some advice? The foam in the attached pic is rotting out and was wondering what the best way to replace that. Spray in foam or Great stuff or? Also, where my metal roof meets the wood roof the seal needs to be re-silicone or sealed with something. Can you recommend a product for this situation? Any help would be greatly appreciated. We have seen this many times in the past and fixed it several ways with unconventional methods. The idea is to stuff something in the opening that will expand but not rot over time. I remember about 30 years ago you could buy foam that asphalt saturated and that was used for areas like this. My first suggestion would be to find someone that supplies metal roofing material. They might have a product that’s readily available for this. Now, if that’s not possible, then a spray foam. 1. Make sure the foam does not expand further than the lip of the metal above. If it does, when it has settled, you need to remove the excessive foam, so it sits back in that area. 2. Get a gallon of tar; This is the trowel grade consistency tar. Not the liquid tar. 3. Take a trowel and then smear the entire face of the foam with the tar. This method will work as long as the foam is set back in the opening and when water runs off from the top, runs in front of the tar that was smeared. If the foam is sticking out to the front, then you could be diverting water back into that space and cause more leaks. The trowel grade tar we know is the best on the market is Karnak 81, trowel grade. You might have to order that from a roofing supply place. They come in 5 gal pales and cost around $80 per pale. Let me know how you make out to contact me directly via my cell text or call 203 858 0080.